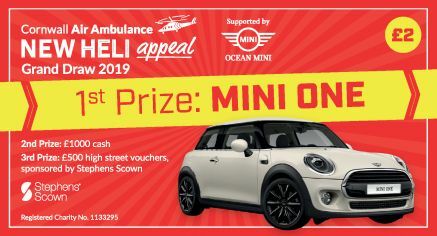 Cornwall Air Ambulance Trust conducts the online element of their raffles through CFP Lottery & Raffles Ltd - a registered External Lottery Manager (ELM) licensed by the Gambling Commission. CFP Lottery & Raffles Ltd operate a platform which complies with all relevant codes and remote technical standards. Cornwall Air Ambulance Trust will use gambling software (a Random Number Generator (RNG)) produced by CFP Lottery and Raffles Ltd which has been approved by the Gambling Commission. Draws are conducted using a random number generator, or blind draw, in plain sight of witnesses. We publish draw results on our website and in letters to players. Rules are also available on our website. Rules and results are always available on request. Cornwall Air Ambulance Trust will reserve the right to offer alternative prizes of equal value if, due to circumstances beyond its reasonable control, the stated prizes are no longer available. In the event that a telephone or online complaint cannot be resolved by the ELM (CFP) or representatives of Cornwall Air Ambulance Trust, CFP will provide free third party arbitration via IBAS. In the event that a written complaint cannot be resolved by the ELM (CFP) or representatives of Cornwall Air Ambulance Trust, CFP will provide free third party arbitration via IBAS. Players can request a self-exclusion to be added to the Cornwall Air Ambulance Trust database so that they are removed from further addressed lottery communications including post, telephone, email and SMS. All self-exclusion requests along with the date of the request will be captured on to the record on the Cornwall Air Ambulance Trust database and will be in place for a minimum of six months. All reasonable steps will be taken to prevent any self excluded individuals participating. A restriction of 50 tickets per customer will be in place unless customer interaction occurs. Without customer interaction chances will not be entered in to the draw. Interactions will be recorded and where the tickets are purchased beyond the limit, records will be kept for 3 years.